International Nigerian artiste, David Adeleke, popularly known as Davido has congratulated the people of Osun state as the Osun State election Tribunal declared Senator Ademola Adeleke winner of the September 27, 2018 governorship election in the state. 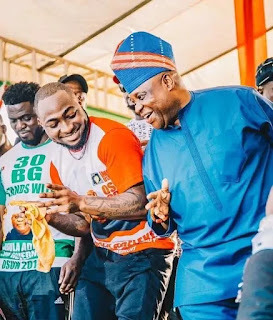 Davido noted on his twitter handle that “Imole ti de” after which he congratulated all the people of Osun while he gave them heads up ahead of a new tenure in the state. The tribunal had on Friday held that the September 27 rerun election in the state was illegal. The three-man panel of the Tribunal gave the judgement following the petition filed by the governorship candidate of the Peoples Democratic Party, PDP, Senator Ademola Adeleka against the All Progressives Congress, APC, and its candidate, Gboyega Oyetola. The Tribunal also agreed to deduct 2,029 votes from the APC scores and 1,246 votes from PDP votes in the 17 polling units where there was non compliance. Reacting to the ruling, Davido congratulated people of the state for the victory.